SNAV hydrofoils in service to Procida connect Naples to the island quickly and safely, with daily departures all year round; moreover, the crafts also operate on Procida-Ischia route (Casamicciola port). Our hydrofoils in service to Procida connect Naples to the island super quickly and safely, with daily departures all year around; moreover, the boats connect Procida to Ischia (Casamicciola port). The hydrofoils in service to Procida guarantee quick and pleasant navigation thanks to the on-board services specifically studied to make your trip more comfortable. SNAV special offers include discounts and price reductions for students, families, commuters and groups. You can book your tickets online conveniently from home, avoiding queues and saving time. SNAV hydrofoils give you the opportunity to discover the beauties of the island of Procida, the smallest of the archipelago of Campania region. 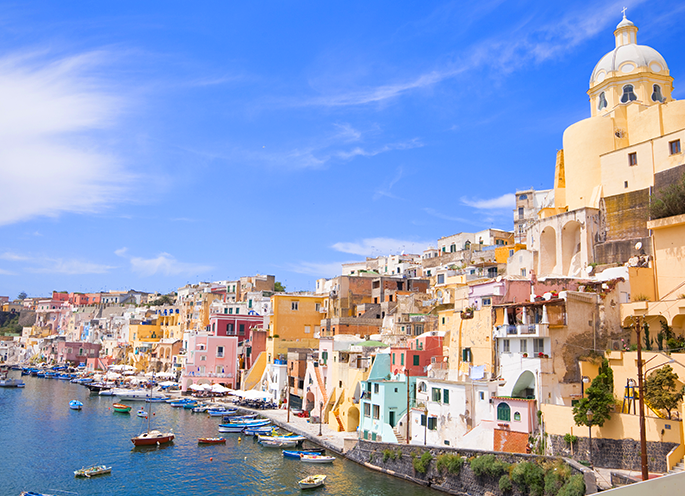 Mild and quiet, Procida is a welcoming place, full of enchanted landscapes: you will enjoy a marvellous view among beaches, bays, inlets, extending to the Phlegraen Fields, the Gulf of Naples and the islands of Capri and Ischia. The great peacefulness of the island, which has always parted from mass tourism, allows you to live a stay or holidays in total relax, among the scents and flavours of the Mediterranean cuisine and in direct contact with unspoiled nature.